As you all know very well by now, I’m always on the lookout for a good project for you fine folks – and all the better if I don’t have to have the boys in the lab make it up for me! Gives them more time to work on installing my home theater system. This is a pretty stellar DIY guide over on The Family Handyman, with illustrations, pictures, a step by step guide, and guidance on what parts to purchase. It could probably be pretty easily simplified as well, if you don’t need something quite as ornate as what they end up with. I know what you’re thinking: you’re worried I’m gonna leave you hanging without linking you somewhere you can buy top quality garden cart wheels to use in this project! Not to worry – you know I’d never do that to you. Our lab boys have some videos in the works for you fine people to kill your spare time with, but in the meanwhile, here’s the folks from This Old House with a quick video on repairing a wheelbarrow tire. Useful if you work in a factory that manufactures loose rusty nails or somesuch. Alternatively, you could equip your wheelbarrow or cart with flat free, solid pneumatic tires and ounce of prevention your way to ultimate yard work victory. 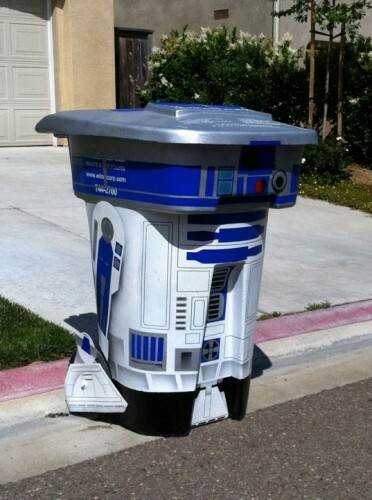 Here’s another DIY project – but the boys in the lab had little to nothing to do with this one! 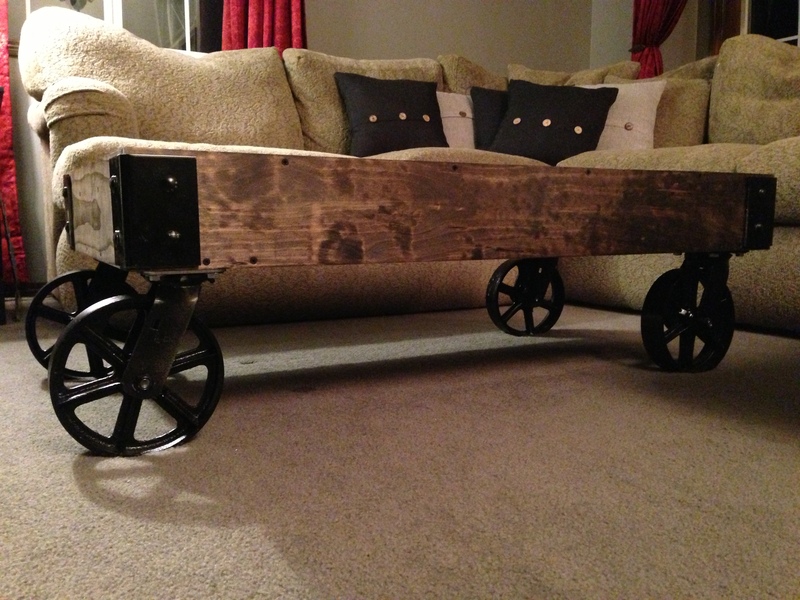 An enterprising customer of ours decided paying $1,000 for a custom table was absurd – especially when a little ingenuity and a trip to Wheel and Caster could do the trick for much less. Take a look – I think it turned out pretty swell. I’m gonna have the lab make me one as soon as they’re done designing the robotic personal assistant I ordered. If you haven’t noticed, it’s starting to warm up out there. And we all know what that means – it’s time to spruce up the mansion! Or duplex/mobile home/medieval castle. Whatever it is, there’s room for improvement. The boys in the lab have whipped up a few ideas for you, along with some products that might help you get them done. Just to get the wheels in your head turning (pun probably not intended). An easy way to keep those pesky neighbors out now that you can’t count on the towering snow drifts to do the job. Whether it’s spring flowers, a sprawling orchard, or a soup kitchen for your local deer population, you’ll need a trusty cart to move your supplies around. You know it’s gonna happen. Grass don’t stop growing. 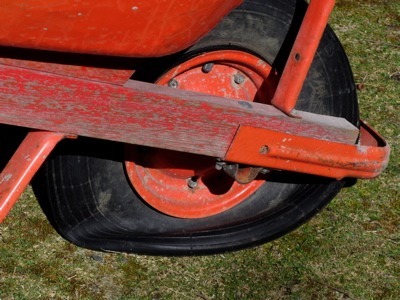 If your mower isn’t quite up to snuff after hibernation, we can get it rolling again. Here’s another DIY project the boys in the lab dug up – this one’s for the aspiring film makers among you. Sometimes that perfect shot needs to be a smooth pan, or slow zoom out. Your options are to walk real careful (and hey, shaky-cam shots are hot right now), spend a few grand on a professional rig, or check out this handy DIY guide over at Instructables.com. Their build uses used rollerblade wheels, but you could accomplish the same effect with these hard rubber wheels or, with a little creative mounting, these light duty plate casters. The rubber casters would likely give the dolly a smoother ride, and the plate casters would eliminate having to jury-rig the axles, giving the dolly more capacity.